Giving the work an enhanced sense of distance, the mediation here is at least triple: a historical study, puppet-work, and video. No one comes out looking good, except the puppets themselves. 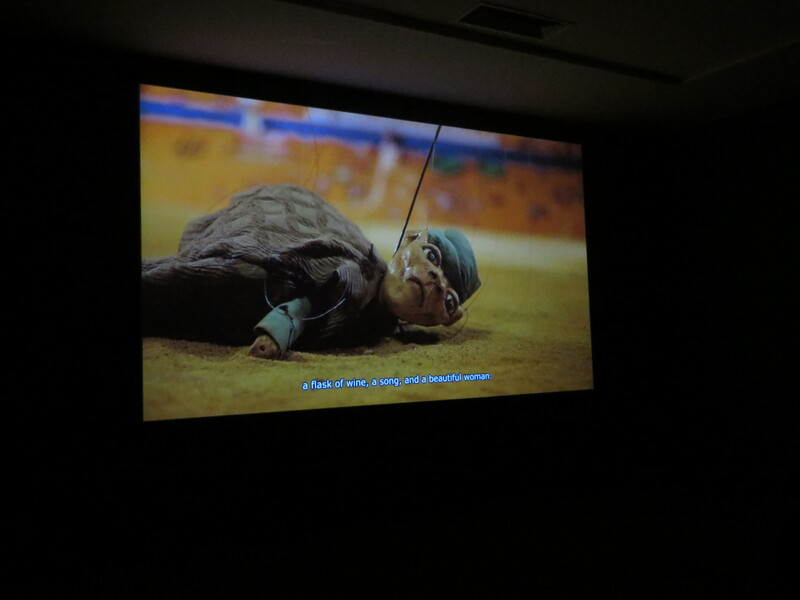 Without a simple or easy political takeaway or moral lesson, Wael Shawky’s video trilogy Cabaret Crusades shoots a puppet show based on Amin Waalouf’s The Crusades Through Arab Eyes. Its primary virtue is the unflinching and honest eye. Running over 3 hours in total, it’s a long and difficult watch. With not a lot of time, I made it through a long patch of the first installment and wandered through the gallery to see on view the puppets and some of the stage settings. In Arabic, the storytelling itself is slow, even dull and plodding, with not a single bright point placed along the way. Marked by conspiracy and massacre, what I managed to see stood out as darkly lit and brooding commentary on history and historical violence. The puppets are particularly strange. Like any human historical actor, they showed themselves to be both animate and wooden at the same time. At some point, I’d like to sit through and watch the entire spectacle, which like any historical act, you just have to sit through as it unspools. “Wael Shawky presents his epic video trilogy that recounts the history of The Crusades from an Arab perspective. Inspired by The Crusades Through Arab Eyes by Lebanese historian Amin Maalouf, Shawky’s videos chart the numerous European campaigns to the Holy Land, starting from the early Crusades from 1096–1099 A.D. that are depicted in CABARET CRUSADES: THE HORROR SHOW FILES (2010) and the First and Second Crusades from 1099–1145 A.D. in CABARET CRUSADES: THE PATH TO CAIRO (2012). The MoMA PS1 exhibition will feature both works and debut the third and final video from the series, CABARET CRUSADES: THE SECRETS of KARBALA. This entry was posted in uncategorized and tagged art, Islam, Museums & Galleries. Bookmark the permalink.